The construction industry is one of the rising opportunities for robotic automation. 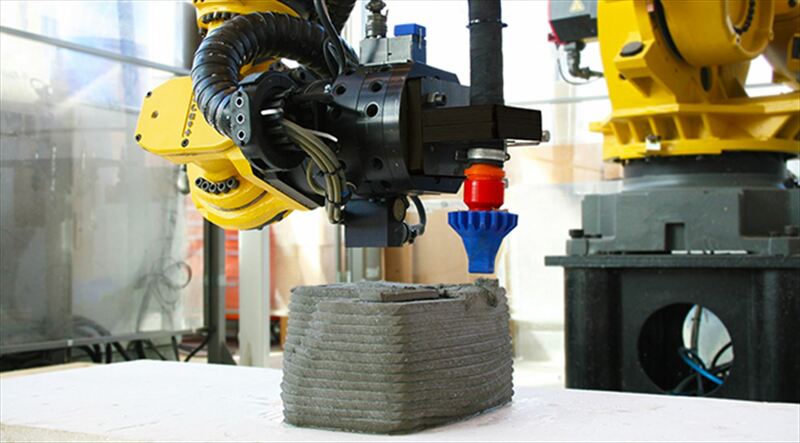 There are now robots at many stages throughout the entire construction lifecycle, from robots that can 3D print entire concrete houses to robots which can demolish buildings autonomously. However, although automation is on the rise, the construction industry is still suffering from a lack of skilled workforce in some key areas. One of these shortages is the manufacturing of steel rebar. A Norwegian startup named Rebartek is looking to change all that with their RoboDK-powered rebar manufacturing process. Skills shortages (aka skills gaps) occur when there are not enough trained people in the wider jobs market to fill certain positions in an industry. The construction industry is full of them. For example, according to a 2016 study of one US county 38 out of 41 construction jobs had a skills gap caused by a lack of graduates with the required skills to fill key positions. “Rebar” is a vital component in many modern buildings. It consists of steel bars or mesh which is added to concrete to improve the structure’s strength. Concrete is very strong under compression forces, but will crack under tensile stress. Rebar adds the necessary tensile strength. Rebar manufacturing is still mostly a manual process. According to Rebartek, 99% of rebar manufacture is performed by hand. This is especially a problem as there are shortages of rebar workers across the world. In a 2013 study, researchers in Ball State University found that “Reinforcing Iron and Rebar Workers” had received one of the top 5 highest pay rises within the construction sector in just 3 years. Such pay rises are often a sign of a skills shortage, as businesses have to increase the wages for hard-to-fill jobs. Robots are an increasingly good solution to filling skills gaps. This is exactly what startup Rebartek aims to achieve. Rebartek uses industrial robots to manufacture high-quality rebar cages at short notice. This automated approach provides a great deal of scalability. According to Rebartek, they are the first company in the world to do this. But, bringing a new technology to a well-established task is not always easy. New robotic-based solutions often require a pioneering mindset. Thankfully, Trommer has plenty of experience. Before founding Rebartek, Max Trommer was no stranger to introducing new technologies to the construction industry. 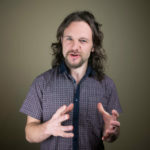 He had already developed web apps to improve the workflow of road construction projects and rolled out new project management software to established construction businesses. With his team, Trommer hopes that his robotic solution will make waves in rebar manufacture. “The raw materials are delivered as straight ~12m long bars or as rebar wound-up on coils. First, each rebar goes into a bending machine that straightens, bends and cuts it into the specified shapes. Robots then preassemble those into “cages”. The team’s solution is based around two KUKA manipulators. One robot uses a welding tool and the other has a customized gripper. 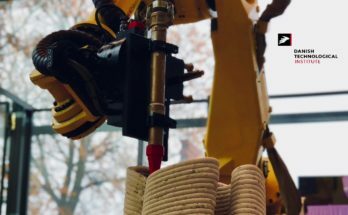 Pick and place — The gripper robot picks up individual lengths of rebar and places them in the support frame. In this video, for example, they are using short lengths of rebar and welding them into a square lattice pattern. When the weld is complete, the robot picks up the cage using a custom attachment at the top of the gripper. Welding — The other robot uses a welding tool to join the pieces of rebar. As we discussed in a previous article, robot welding has some great advantages over traditional welding and is easier to achieve than many people think. 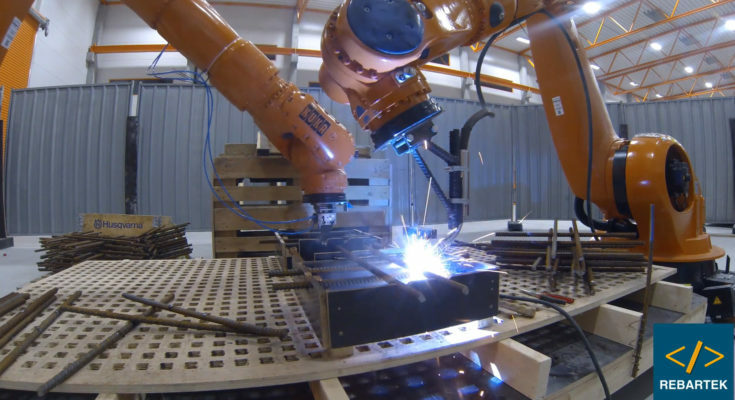 Working in tandem, the two robots are able to achieve a potentially continuous output of prefabricated rebar cages with consistent weld quality. The team can also customize the cage design to meet the needs of their clients and use a workflow tailored to their client’s needs. With RoboDK, the team found it easy to program their robots to work together seamlessly. Its offline programming means that they can tackle small series projects, which is a typical challenge in the construction industry. 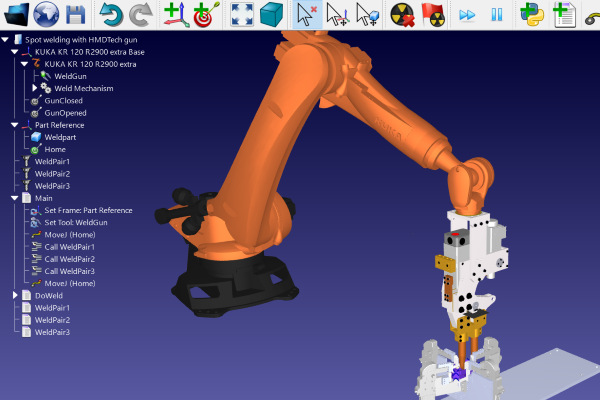 It has enormous flexibility through the API — The RoboDK API allows for a huge flexibility in robot projects. Although many of our users stick to its graphical interface, it is only when you start programming with the API that you can appreciate the real power of RoboDK. Rebartek has big plans for their solution so this was vital. It’s manufacturer agnostic — Unlike many offline programming solutions, RoboDK is not tied down to any particular robot manufacturer. This was a big benefit for Rebartek as it allowed them to properly assess their solution with a UR robot before investing in two large KUKA robots. For more information, see our article Will Offline Programming Work With My Robot? Max Trommer and his team have a very promising business model already. But, they are not going stop there. Is AI-powered automation the future of rebar manufacturing? Rebartek is trying their best to make that happen. They might even help to solve the skills gap.